The Khmer Rouge Trial: What Will Justice Be? 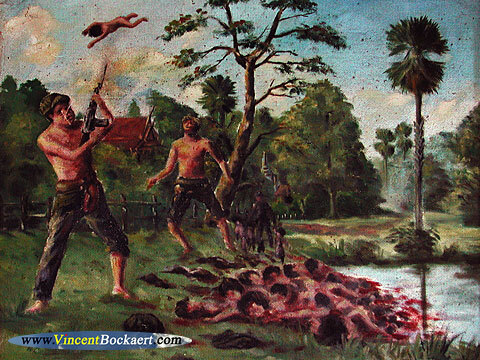 About 1.7 million innocent Cambodian people were slaughtered by the brutal Khmer Rouge regime from 1975 to 1979; Cambodia was known as the Killing Field. The regime destroyed the whole society and led Cambodia into a third world country. Cambodian children, in particular, have lived with hopelessness, no education, and the darkness of their daily lives. One of the greatest crimes of the 20th century has gone unpunished for 30 years. Between 1975 and 1979, the Khmer Rouge systematically tortured, starved, and smashed approximately 2.2 million fellow Cambodians, or between one-fourth and one-third of the entire population (Mussomuli 2006 pg. A.12). Day after day the victims cry for justice. Why is justice so important? And why has this justice taken so long? For over three decades, the questions have remained unanswered. The Khmer Rouge leaders have gone unpunished, some remain in power, and the victims are still the victims. Now, the Royal Government of Cambodia and the United Nations have agreed to establish the Khmer Rouge Tribunal Trial with the objective of punishing the former Khmer Rouge leaders and finding justice for the victims. The Cambodian people, as well as the rest of the world, applaud the initiative of setting a trial. However, skeptics question whether or not justice will be achieved. The main reason for the skepticism is the seemingly poor choice of the judges who will serve on the trial panel. Mr. Chhang, Director of the Documentation Center of Cambodia, stressed in his welcome statement to the Khmer Rouge Tribunal Staff (December, 2005), It is not possible to emphasize how important it is that all aspects of the trial proceedings are transparent. Transparency should begin with the selection of judges and those who will head various offices and departments for the tribunal. He closed his statement with the demand that If the Cambodian judicial system is to advance and public confidence in it is to grow, the UN and the Royal Government must demonstrate that these personnel are selected in a fair and open way, and one that is free from political influence. The trial has been a long awaited event and is of historic significance. There cannot be miscalculations or misjudgments from the panel of judges. This panel is made up of Cambodian judges affiliated with Cambodian Peoples Party, the ruling political party which has former Khmer Rouge members as leaders; and international judges who have little or no background on the deeply traumatic experiences of the Cambodian people. Because of inadequacies of the qualifications of the panel of the judges, there are valid concerns about the outcome of the trial. An outcome without a proper justice will not only victimize the Cambodian people again but will also reinforce the culture of impunity in Cambodia forever. On the one side, justice must meet international standards and the victims demands; and on the other hand, justice must also address Cambo! culture. Only by strictly adhering to these requirements, will justice be served. The trial is important and must move forward. The conclusion of justice, either meets the international standard or serves the victims needs, will be another vital step. To brush aside all these concerns, involvement from the victims, the international community, and all non-governmental agencies must be forcefully and actively engaged and monitor the trial. These groups have the social responsibility and power and must demand accountability. The victims must speak out and demand what they want and what they feel; what form they want justice to take, for what they want the Khmer Rouge leaders held responsible; and what they want to tell the world. Likewise, the world must pay close attention to the trial proceedings and intervene immediately if the trial heads in the wrong direction. Article 28 of the agreement states that The UN can halt its assistance to the RGC should the latter act in a manner that is not in conformance with the agreement. Any verdicts must respond to the victims demands for justice to be truly addressed. Finally, this justice will not only educate the Cambodian people about what happened and why the tragic event occurred, but it will also teach the Cambodian leaders how profoundly this past event affected innocent peoples lives, especially Cambodian children, who were thrown into a world without a welfare system, without education, without a hope for the future. With a bona fide justice, a new chapter for Cambodia will begin.